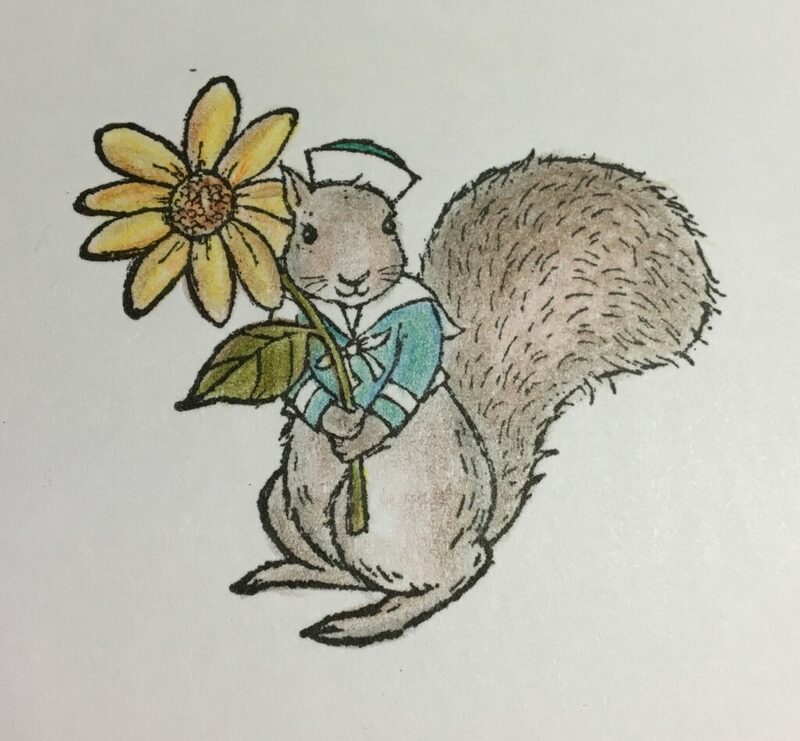 As promised in my last post, today I would like to share the colors and techniques I used to color the cute squirrel from the Fable Friends stamp set. Take a look at the colored image below. This is the one that will be explained step by step. 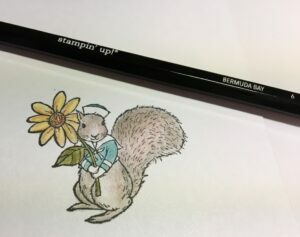 First, stamp the squirrel image onto a piece of Whisper White card stock with Memento black ink. Then, grab your Watercolor Pencils. 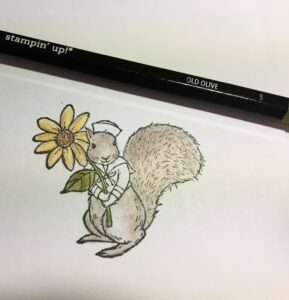 If you don’t have a set of Watercolor Pencils, I highly recommend Stampin’ Up!’s set. Below, I’ll walk you through the process that I used, highlighting the Watercolor Pencils and tips and tricks. A few steps will be described. Directly after the steps, you’ll find a series of pictures that will show the steps just described. Click on any picture to see the details more easily. 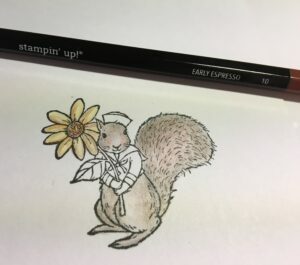 Step 1: Start with the Early Espresso (#10) Watercolor Pencil to add a light layer of brown as the base of the squirrel’s body and face. Go light on this layer. You’re going to add more layers of color. And (obviously), it’s easier to add layers of color than to take them off!! Use small circular motions to add this layer. Avoid the very middle of the squirrel’s face and very middle of the squirrel’s body. You’re going to leave those areas light, really almost white. Also, don’t put a lot of brown in the middle of the tail. 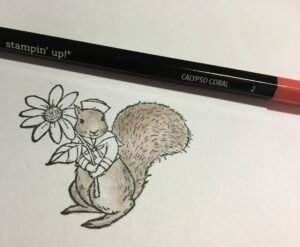 Step 2: Use the Calypso Coral (#2) Watercolor Pencil to give the squirrel’s “cheeks” a little color! 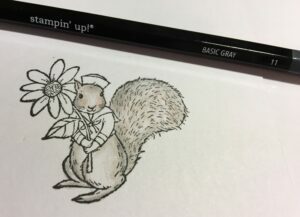 Step 3: To add dimension to the image, use the Basic Gray (#11) Watercolor pencil to highlight the “edges” of the cheeks, tail, feet, and body. The gray color on the edge of images mimics shadows and adds depth to your coloring. 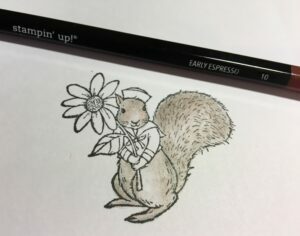 Step 4: Blend the areas you have colored by using the Early Espresso (#10) Watercolor Pencil to add a top layer of color. You may want to put a little more pressure on your coloring to blend the brown into the other colors. Step 5: If you want to highlight the cheeks and middle part of the tail, you can add a little more Calypso Coral (#2). Step 6: Now, start working on the flower. 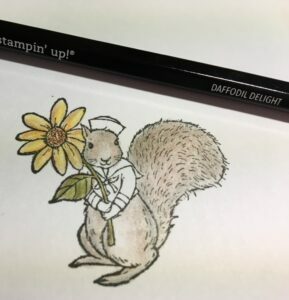 The first color is Daffodil Delight (#4). Add a base color to the petals of the flower. 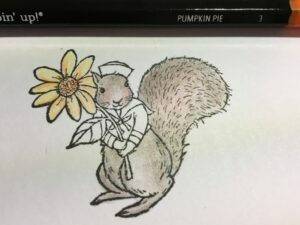 Step 7: To add interest and additional color to the petals, in various places on the petals add some Pumpkin Pie (#3). Also add Pumpkin Pie to the center of the flower. Step 8: Use your Early Espresso (#10) Watercolor Pencil to add shadow highlights to the petals and flower center. 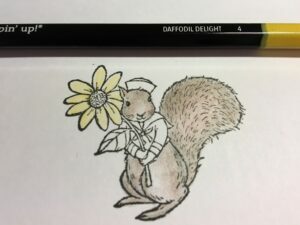 Step 9: Finish your flower by using the Daffodil Delight (#4) Watercolor Pencil to blend the colors in the flower’s petals. Just like in Step #4, you may want to add a little more pressure on your coloring to blend the colors. Step 10: Color the stem and leaf with the Old Olive (#5) Watercolor Pencil. If you want to add darker shades of Old Olive to the leaf veins, use more of the tip of the pencil. Step 11: Shade the leaf edges and parts of the stem with the Early Espresso (#10) Watercolor Pencil. 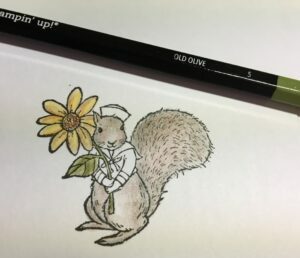 Step 12: If you want to add another layer of color to the leaf, use the Daffodil Delight (#4) Watercolor Pencil in a few places. Step 13: When you like the coloring in the leaf and stem, blend the colors together by using the Old Olive (#5) Watercolor Pencil to blend. Just as before, you may want to add a little more pressure to get a good blending of the colors. 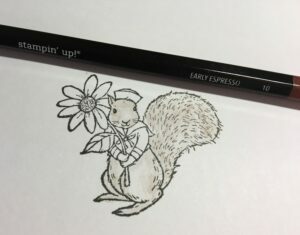 Step 14: The last part of the image to color is the sailor suit and hat. 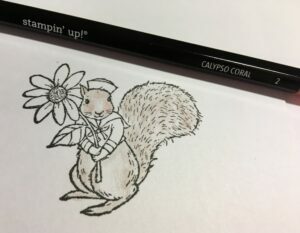 Use the Bermuda Bay (#6) Watercolor Pencil to color the tip of the hat and parts of the sailor suit, as pictured. Step 15: Add Pacific Point (#7) color to the edges of the sleeve and other areas that could have shadows. Step 16: Use the Bermuda Bay (#6) Watercolor Pencil to blend the colors on the sailor suit. 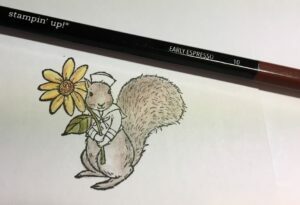 Final touches: Color the squirrel’s hand first with Early Espresso (#10) and then highlight with Basic Gray (#11). Then, touch up any areas that you feel need more color or blending. 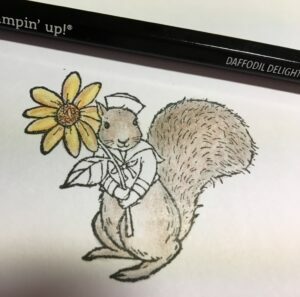 My husband thinks that, when I was a child, I didn’t have enough time to color! He says that because I enjoy coloring with Watercolor Pencils so much. I find the process very relaxing. I also like the fact that no two images will look the same when they are colored. 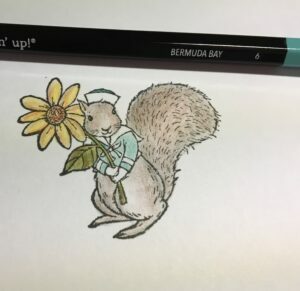 The Watercolor Pencils make me feel more like an artist. I really hope you’ll give them a try. 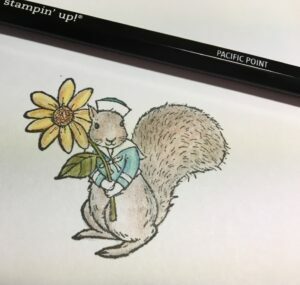 Below are the main products I used to stamp and color the squirrel. 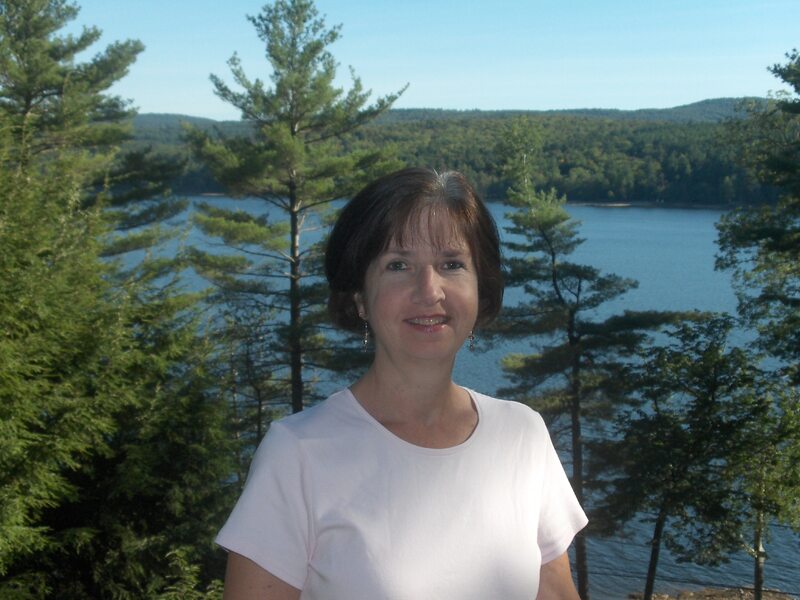 If you click on any image, you’ll go directly to my on-line store.